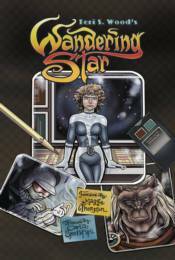 Wandering Star is a beautiful story, written years before its time. This much-praised space drama follows the far-flung adventures of Cassandra, daughter of the President of the United Nations and the first terran accepted into the Galactic Academy. Cassandra discovers to her woe that Earth isn't the most popular of planets and joins the outcasts working on the Wandering Star, the Alliance's prototypical spaceship. When the Bono Kiro, the Alliance's longtime enemy, makes a sudden reappearance, Cassandra and her misfit crew just might turn out to be the galaxy's last hope. Sure to delight the legions of fans of the series, this beautiful hardcover edition collects all 21 of the original comics for the first time.